The preformed face and shoulder cradles, help to minimize facial aches as well as face creasing. The left and right airway will help to improve your breathing. It is important that a pillow is supportive enough to reduce the body weight impact on the shoulders to allow blood flow to your arms. 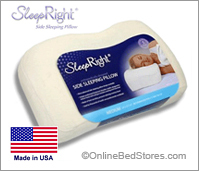 The Splintek SleepRight Side Sleeper pillow is made in the USA. and has a 5-year replacement warranty from the original purchase date, and through selected retailers. The pillow is exchangeable for size if purchased from an authorized retailer like BeyondBeds.com, if your original purchased size was not right for you. For additional information and help in determining the correct height and size for you, we recommend visiting and then contacting BeyondBeds.com to speak with a qualified representative that can assist you. 5-year warranty. Made in the USA. Size exchanges are permitted within 30-days.